I have a wonderful book hangover after reading this thought-filled, inspiring, and romantic tale: Rider of the Crown (Crown of Tremontaine Book Two) by Melissa McShane. SUMMARY (from back): Imogen, warrior of the Kirkellan tribes, has never wanted to be anything else. But when the long war between the Kirkellan and the country of Ruskald ends, the terms of the peace treaty require Imogen to be married to the vicious King of Ruskald for five years. Confined to his freezing city, forbidden to fight, Imogen sees nothing but darkness in her future—until the arrival of Elspeth North, heir to the Crown of Tremontane, brings three countries to the brink of war and sets Imogen free. Now, sent to be the ambassador of her people to Tremontane, Imogen faces new challenges as she struggles to maintain her warrior’s identity in a world of glittering ballrooms and foreign customs. As a diplomat, Imogen discovers skills she never knew she had—as well as a forbidden attraction to the handsome and charismatic King Jeffrey North. But when war once again threatens not only Tremontane but her own people, Imogen must decide: is she the warrior, the diplomat—or something greater? 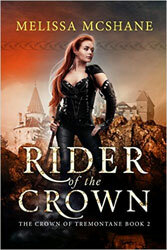 WHAT I THOUGHT: Rider of the Crown picks up about twenty years after Servant of the Crown (The Crown of Tremontaine Book One) and includes only cameos of Allison North, the Royal Librarian, that I came to love. I was a bit disappointed initially that this book did not add the next installment of the Royal Librarian’s adventures, but it was nice to see a slice of Tremontaine from other character’s perspectives. By this time in the story, King Anthony and Allison have had two children, Jeffrey and Elspeth, and Anthony has died, making Jeffrey an unmarried and very eligible King. I won’t go into what all happens for you can read that yourself, but I loved the theme the author weaves throughout the book: who am I really? Am I what I’m good at? Am I what I am passionate about? Am I who I love or who loves me? Something else, or all of the above? We follow the strong heroine, Imogen, through three phases of her life during which she keeps asking herself this question. The first phase is living as “wife” to an enemy for five years as part of a peace treaty her mother signs as ruler of Kirkellan. She finds herself, a Kirkellan warrior, among the enemy who despise her and her people and she wonders how she will endure for five years in that hostile environment with an arrogant, power-hungry ruler for a husband, temporary though it may be. She grows and learns about herself over a year until the ruler makes a choice that betrays the ethics she believes in and she annuls the peace treaty to stand for what she believes is right. In part three, Tremontaine finds itself at war with the country who Imogen was initially wed to, and she sheds her ambassador status to retake her Kirkellian warrior heritage to lead her warriors and those of Tremontaine into battle. Clearly a good leader of soldiers, Imogen must, in the end, come to grips with whether pursuing love or the path she had always envisioned, will be her future. As an author, I appreciate a well-crafted, engaging storyline. And this one lives up to that and adds more by challenging the reader to ask the question of ourselves…Who am I really? I give this book 5 stars. Great review. My “To Read” list keeps growing. Thanks for the suggestion! Thanks so much! Sorry to make your TBR glower down at you. LOL! How many times did you have to read the book to remember all these details? LOL! Just once. That’s because the author kept the theme going through each section, then ended it very well, with Imogen coming to her own conclusion. It was well done. Very well constructed and informative review. I can see you have enjoy reading this book. I like your review very much and hope to see more from your column. Thanks so much! I hope you enjoy as much as I did, if you read it. The review. Yes. Better than I could admittedly. Sounds like an interesting fantasy book. Good luck with your book launch!